Hot oat meal with healthy oat bran, pieces of dried broccoli and fried onions, finished with pine nuts and fine spices. Simply add hot water. Ideal for breakfast, a light lunch or dinner or as a side dish. Hand-made in the Austrian Tyrol and 100% organic. 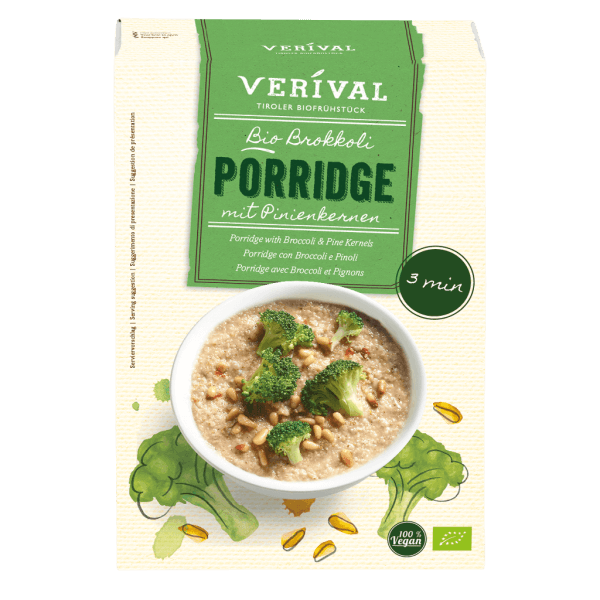 Wholegrain oat bran* 85,4%, broccoli* 4%, pine kernels* 4%, salt, red pepper*, onions*, nutmeg*. Put 65g porridge (1 portion) in a bowl and pour over (depending on the consistency desired)150ml boiling water. Stir, leave to soak for 3 minutes and enjoy warm.